Accuweigh Perth recently supplied onboard truck scales for a Volvo 8x4 hook truck for Sims Metal in Western Australia. The onboard truck scales from PM Onboard were fitted to the truck to accurately track scrap metals being collected from mine sites in WA’s Pilbara region. 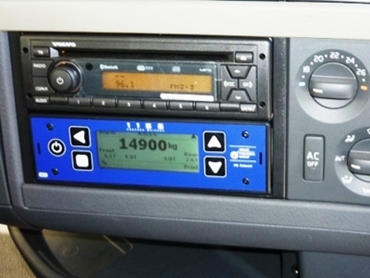 Accuweigh is the exclusive Australian distributor for PM onboard vehicle weighing equipment. PM Onboard is UK’s largest provider of onboard truck scales and overload protection systems. Comprising of eight heavy duty load cells mounted between the truck chassis and the bin skid plates, Accuweigh’s onboard truck scales use a digital weight indicator mounted in the truck’s cab to display the skip weights to the driver. By generating fast and accurate weight readings, the PM onboard truck scales eliminate the need for the truck to proceed to a weighbridge to obtain legal bin weights. Additionally, Accuweigh’s onboard truck scales also prevent accidental overloading, which could incur heavy fines under the CoR legislation, and provide Legal for Trade weight tickets to allow invoices to be generated. Australia’s leading industrial weighing company, Accuweigh operates a network of eight branches across mainland states providing superior product support for all onboard truck scales.